The Queen Mary is one of the most famous landmarks in Long Beach, just half an hour from the Los Angeles International Airport (LAX) or downtown Los Angeles. The ship is now a hotel and attraction with a variety of restaurants, nightlife, tours, and special events on board and in the adjacent Events Park. The Queen Mary is purported to be haunted, and there are many activities on board centered around ghostly activities, including the daily Haunted Encounters and the annual Queen Mary Dark Harbor haunted ship attraction. The Queen Mary is located at the south end of the 710 Freeway, on the water in Long Beach. The property includes the outdoor Queen Mary Events Park and the Queen Mary Dome, which once housed Howard Hughes' albatross of an airplane, the ​Spruce Goose, and now houses the Long Beach Cruise Terminal. The former luxury ocean liner and World War II military transport clocked 1,001 trips across the Atlantic before settling in its current home. The elegant lady's maiden voyage departed from South Hampton, England, in 1936. From 1940 to 1944, the ship was deployed as a military transport. It returned to luxury cruise service after the war. The Queen Mary was retired in 1967 and opened as a hotel and attraction in Long Beach in 1971. The main Queen Mary exhibits, scattered around the ship and accessible on the self-guided tour, re-create the history as both an elegant ocean liner and a military transport. Key exhibits include the wheelhouse, captain's quarters, and the radio room on the upper decks of the bow and the engine room exhibits below aft (back of the ship). Cruise liner exhibits include staterooms, dining rooms, gym equipment, nursery, and additional exhibits of furnishings and art. Most of the military exhibits are gone, but there is still a recreation of sleeping quarters and a few artifacts at the end of the engine room exhibit. Other exhibits and attractions include the Ship Model Gallery and The Shipyard, which is a model of the Queen Mary made of LEGOs. Next to the Queen Mary is the Russian Foxtrot submarine "Scorpion." The sub was built in 1972 in Leningrad and used to search for and track enemy forces during the Cold War, especially in the Pacific Ocean. It was decommissioned by the Russian Navy in 1994 and found a new home next to the Queen Mary attraction in 1998 after a brief tour in Australia. You can admire the outside of it, but it is no longer available to tour due to structural issues. The Queen Mary also hosts touring exhibits in various other spaces aboard the ship. The Churchill Exhibit: In May 2016, the Queen Mary inaugurated a new Winston Churchill exhibit that includes paintings as well as reproductions of authentic Churchill War Rooms bunker where Churchill and his staff confronted Nazis. 4D Theater: Inside the 121-seat theater, you can choose between two movie 18-minute options in 4D format. You can feel the movement of every scene as the surroundings produce fog, wind, mist, and scents. General admission to the Queen Mary includes a self-guided tour of the main exhibits and The Steam and Steel Tour. If you don't have a lot of time, you'll see more exhibits on the self-guided tour than on the guided tours, because the guided tours skip most of the public exhibit areas. 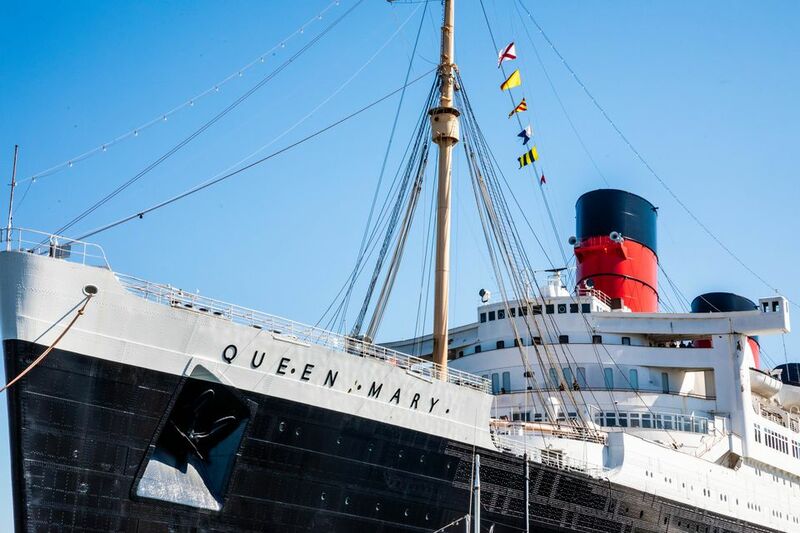 If you have time for more, the Queen Mary also offers several guided tours that take you into areas off-limits to the general public and focus on different aspects of the ship and its history. The Glory Days Tour gives a historical overview of the ship's origins and peace and wartime activity and introduces you to the original art and craftsmanship of the ship. The tour varies depending on which spaces are in use for other things and which guide you have. It may include a look into various ballrooms, the Veranda Grill, or the first-class swimming pool. While they all hit certain key points, each guide tells different stories and chooses their own route, so you could take multiple tours and hear different stories. Most of the Glory Days guides don't talk about the haunted areas of the ship. The Haunted Encounters Tour takes you to spots throughout the ship where ghosts have allegedly been sighted, including the Observation Bar, engine room, a couple of staterooms, and the first-class swimming pool. Ghost sightings on the actual tour are rare, so don't expect that. The nightly Paranormal Ship Walk Tour is a two-hour tour of the ship's haunted hot spots led by a paranormal investigator. It's longer than the daytime Haunted Encounters Tour, goes to twice as many locations, and is offered twice nightly. The Paranormal Investigating Tour lets participants use some of the "tools of the trade" to investigate paranormal activity at a few specific locations. Since you spend more time investigating, you visit fewer locations than on the Shipwalk Tour. It's offered Friday through Sunday nights. The Dining With the Spirits and Tour combines dinner at Sir Winston's Restaurant & Lounge with a Paranormal Investigating Tour. It occurs on Fridays and Saturdays, with dinner at 7 p.m. followed by a two-hour tour starting at 9 p.m. There are a variety of restaurants and snack bars on the Queen Mary ranging from a coffee shop to an award-winning fine-dining restaurant. Sir Winston's Restaurant & Lounge is the most exclusive of the restaurants on the Queen Mary, serving continental, British, and California cuisine alongside a view of the Long Beach coast from window tables. The decor includes elegant hardwoods and rich, dark gold velvet drapes and chairs with intimate lighting and large picture windows. In addition to its famous Chateaubriand and beef Wellington, it offers rack of lamb and baked stuff salmon. Where: Sir Winston's Restaurant & Lounge has its own level, accessed up a stairway from the aft starboard (back and water side) of the Sundeck. It is not wheelchair accessible. You must be able to navigate the stairs to enter the restaurant. Dress Code: Smart-casual attire is required . Parking: There is a fee for parking, with an additional cost if you opt for a valet. If a special event is going on, event parking rates apply. The Lounge at Sir Winston's features candle-lit booths and tables. Food service is available. The bar is open during restaurant hours. There is live piano music on Friday and Saturday evenings. Dining With the Spirits: On Friday and Saturday nights, you can dine with a paranormal host and explore the ship's haunted spots after dinner. The cost includes dinner, tour, tax, and gratuities. Chelsea Chowder House & Bar specializes in fresh seafood with harbor views. The restaurant was completely remodeled in 2011, restoring the more casual wooden floors and opening up a wall. The menu was also completely revamped with a diverse selection of chowders, seafood kettles, and a raw bar. Where: Find this dining spot mid-ship on the Promenade Deck and access it on the port (land) side. Parking: There is a fee for parking, with an additional cost if you opt for valet. If a special event is going on, event parking rates apply. Free parking is available after 6 p.m. with validation. The Promenade Café is a casual dining restaurant that is the only full-service restaurant open for breakfast and lunch. The menu is loaded with comfort foods with plenty of cheesy, fried options, but not very many healthy choices. Where: You can find this spot on the Promenade Deck and access it starboard (water side) through the main hall. Parking: There is a fee for parking, with an additional cost for valet. If a special event is going on, event parking rates apply. The Observation Bar & Art Deco Lounge, which used to be the First Class Lounge, has a wide selection of spirits and bar food, including flatbread pizzas and sliders. It is one of the best places in town to watch the sun set. It sometimes has live music and comedy shows. Where: Locate this bar and lounge at the bow (front) of the ship on Promenade Deck and access it from both sides of the ship. Parking: There is a fee for parking, with an additional cost for valet. If a special event is going on, event parking rates apply. There is a two drink or drink and food minimum for validation. The Midship Marketplace is a snack bar on the port side of the Promenade Deck serving Starbucks coffee, homemade pastries, bagels, breakfast sandwiches, and more. Where: Locate the Midship Marketplace on the port side of the Promenade Deck. There used to be a selection of quirky shops on the Queen Mary that were independently operated. In 2016, they were all replaced with more uniform souvenir shops operated under one umbrella, so you won't find any more Chinese knickknacks or Art Deco apparel. The remaining shops are all in the Main Hall on the Promenade Deck. The shop on the starboard side is geared more toward men's apparel. The one on the port side has women's apparel and gifts, and the one in the middle has British and ship-themed merchandise and food items. There's also a Malibu Wines shop. Just as on any cruise ship, the Queen Mary Hotel has a variety of inner, outer, upper, lower, standard, and deluxe staterooms and suites available for hotel guests. Inner and outer tourist staterooms are pretty cramped, as you would expect on a ship. First-class staterooms have more space. Mini-suites add a living room, and Royalty Suites include a kitchenette. Unlike most cruise ships, hotel guests do not have access to a swimming pool (the pool does not meet California regulations, so it can't be filled), but there is a business center, high-speed internet, satellite TV, and the availability of fitness rooms. For the paranormally inclined, you can also request a haunted room, although ghost sightings are not guaranteed. Guests of the hotel have free access to the self-guided exhibits of the ship. Expert Tip: During holiday events such as Halloween Shipwrecked and the July 4th Celebration, you should only book a room on the Queen Mary if you're planning to spend all your time on the ship. Otherwise, ​you'll be frustrated by the time it takes to get in and out of the parking lot. You can use the free Passport bus into ​​downtown Long Beach to avoid the worst, but even that gets stuck in traffic. One of the Queen's best-kept secrets is the Queen Mary Spa. It's tucked away just off the elevator on the Main Deck. The reception area and some treatment rooms are paneled in the same dark woods as the rest of the ship, with Art Deco built-ins and details, and portholes looking dockside. You'll find brides being coiffed and made up before their onboard weddings and hotel guests fitting in a massage, but anyone can schedule a treatment at the spa. You might be ready for a pedicure and foot massage after exploring three decks on your own and taking a tour. The Long Beach Transit red Passport Bus C will take you from Pine Avenue and 1st Street in downtown Long Beach to the Queen Mary for free. During big events, you can avoid parking delays by taking the bus, but it does get crowded. The Passport Bus is one block from the end of the Metro Blue Line. If you're going to one of the restaurants, bars, or nightlife activities on the ship, get in the hotel lane of parking, drive around past the valet parking to the self-park area closest to the ship, and enter through the hotel entrance, rather than through the main Seawalk attraction entrance. Most of the attraction areas that are included with the price of admission are also available to explore if you happen to be on board for dinner, drinks, or other nightlife options. The Observation Bar is open when all the self-guided tour areas are free to explore. For the price of a couple of drinks, you can get your parking validated and explore the ship. When there's a special event, there's a cover charge to get onto the ship that can be applied to bar or restaurant purchases. The Queen Mary has a number of annual events that you can plan your trip around, either because you want to participate or because you want to avoid the crowds. These are just a few of the many special events and festivals that take place on the ship or in the adjacent events park, which hosts music and food festivals all summer long. Chinese New Year: Celebrate the Chinese New Year with traditional Chinese cuisine, culture, and entertainment. Queen Mary ScotsFest: This event celebrates all things Scottish in honor of the ship's origins every February. Valentine's Day: Bring your loved one aboard the ship for an evening of romance. Mardi Gras: Let the good times roll with Mardi Gras on the Queen Mary. St. Patrick's Day: The ship's historic salons are transformed into a night of Irish dancing, drinks, and food. Queensway 5K: Grab your running shoes, and participate in this family-friendly event. Memorial Day: On Memorial Day, active and retired service members receive free admission. July 4th: The Queen Mary hosts an annual fireworks festival on Independence Day. Rumble on the Water: Held in the summer, Rumble on the Water features local and national MMA fighters who compete aboard the ship. Queen Mary Dark Harbor: This Halloween attraction occurs during the entire month of October. Christmas at the Queen Mary: Occurring from late November through the first weekend in January, this event features ice skating, ice tubing, and make-your-own gingerbread houses. Thanksgiving: Celebrate this holiday on the Queen Mary in November. New Year's Eve: Ring in the new year on December 31.